If you've ever struggled to use a solderless breadboard with an Arduino, you understand how frustrating it can be! I designed this Arduino clone to solve this problem in an inexpensive DIY fashion. Kits with all parts are available in the Adafruit webshop. The Boarduino is an Arduino clone: when programmed with the Arduino bootloader, it can talk to the Arduino software and run sketches just like the original. 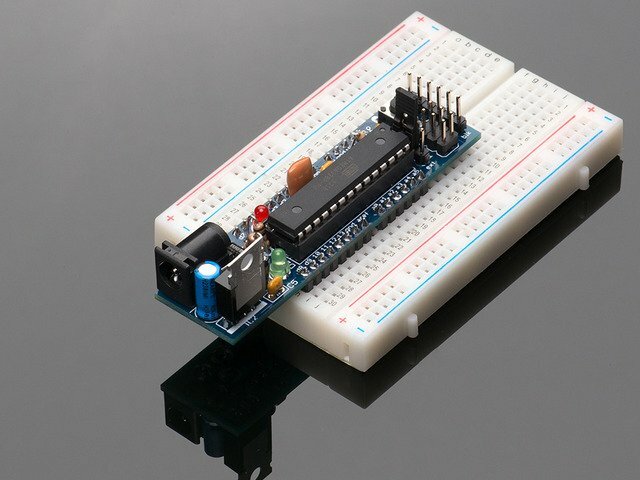 There are noticable differences between the Boarduino and the Arduino. For the DC version there isn't an on-board USB chip. This means you need to use a USB-TTL cable or a MiniUSB (or any other FTDI breakout board) which is not included. There are also no rx/tx LEDs and no rx/tx 1K series resistors. For the USB version, there is an on-board USB chip but there isn't a DC jack or 5V regulator, you can power it through the USB jack. There is a rx 1K resistor so you can use this to talk to serial accessories. If you have a USB boarduino check this page for instructions! This guide was first published on Jul 16, 2013. It was last updated on Jul 16, 2013. This page (Overview) was last updated on Apr 17, 2019.